Apartment N. 48: It can accommodate up to 2 people, it is rented from 74 € per Night (not per person). 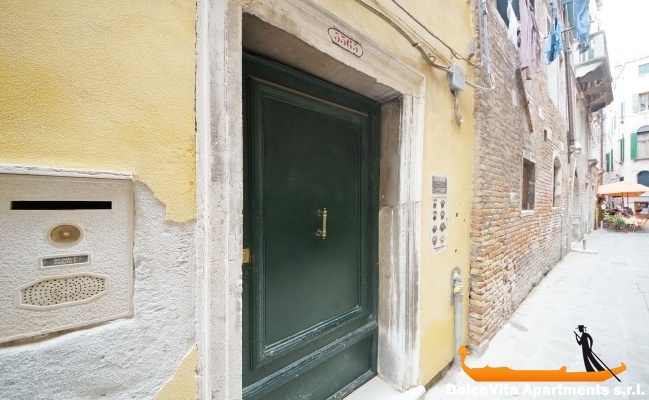 This elegant study in Venice of 45 Square Meters is on the first floor of a historic building, between the Rialto Bridge and the Venice Casino. It comprises an entrance, a living room with two single beds that can be pushed together, a kitchen and a bathroom completely renovated. From the windows, you can enjoy the view over the patio. This is the ideal solution for couples or single. There is also the cradle -available only on request- and with an extra of 15 € per night. If you desire, you can arrive at the apartment also by water taxi from "Piazzale Roma" and from "Marco Polo" airport. Clean, quiet, central, a bit dark. Really effective and efficient service, a lot of kindness. Apartment super well placed to visit. Upon arrival at the airport we took the boat Alilaguna and I sent a message to Suzanna. No problem someone was waiting for us at the address of the apartment. Apartment very well located, clean, well arranged. Good welcome for the delivery of the keys. APARTMENT 48: everything was perfect! I repeat what I had written in September: excellent for the position and for the silence. Great for kindness courtesy and availability. very well placed, quiet, very clean and well organized where we had a very pleasant stay. The apartment No. 48 can be noted with 5. It is very well located for the attractions of the carnival. Neighborhood friendly with a choice of nearby restaurants and very good value for money. 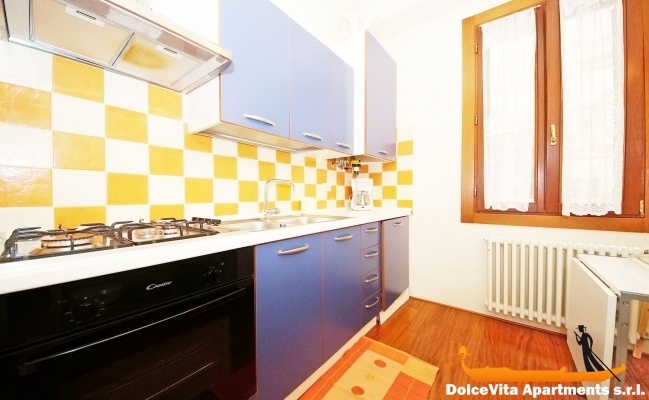 Recommended 'Trattoria tre spiedi'.Very clean, spacious apartment with a warm welcome. I kept your contact information to send them to my friends. Apartment very well located 5 minutes from Rialto and Ca 'd'Oro. In excellent condition and very clean. Quiet and secure environment. Very warm welcome by Suzanna in French. The apartment contains all that is necessary for a comfortable stay (gas stove, oven, microwave, filter coffee maker and 'moka', toaster, central heating ...). Only small regret, not having found a big bowl for breakfast. Excellent price / location / equipment. 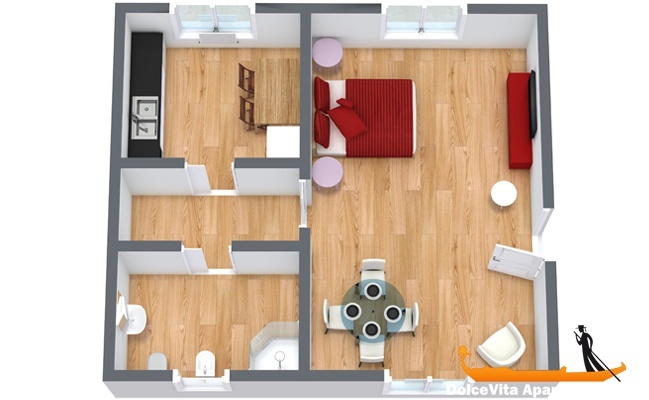 The service provided by DolceVita Apartments srl is perfect: efficient and professional. The apartment is well located to reach all areas to visit and it is also very quiet. Positive contact with the agency. We were delighted to find the peace and quiet of our home in the evening. The location is perfect to explorer Venice and the surrounding areas of Venice (Rialto, Cannaregio, San Croce and San Polo, San Marco). Bakery around the corner with a wide selection of breads and pastries (go there in the morning to choose!) and spritz possible in the cafe right next to the apartment. And I could cook every night. What more ! Well appointed, clean, very well placed, in a quiet location. It merit 5 but I put 4 because there is no air conditioning and it is very poorly soundproofed (you could hear the neighbors at the same level and the noise of work on the street). I was very suspicious at the start because I did not know this site and finally, everything went well. Service VeniceApartementsItaly.com very nice and efficient. The owners in Venice too. I will tell the friends who wish to go to Venice. A big thank you for your service which is really perfect! We were very well received by Susanna. The service is excellent. The location of the apartment is ideal, in a neighborhood full of charm. Excellent cleanliness, comfortable, the apartment is very convenient and very nice. We had a great time. The website is very easy to use and you are very responsive. It's perfect! Apartment clean, functional, well located, quiet, a bit expensive however. We were welcomed well by the owner who took the time to show us around the apartment and to give us some addresses. Very efficient service. Apartment very clean, very well located, comfortable and quiet. The welcome was impeccable, and the recommendations very appropriate. Good welcome, on time, friendly host, comfortable apartment very central a bit dark because on the first floor !! The welcome from Susanna & instructions on how to get to the apartment were good. The situation of the apartment was brilliant as it was away from the busy tourist areas however it was very near all the main areas. The comfort of the apartment could have been greatly improved by better lighting & a couple of easy chairs rather than 4 hard dining chairs. The apartment N 48 we rented was great, great location, comfortably arranged. Small problem: the neighbors in the yard a bit noisy sometimes difficult to find the apartment from telephone explanations! Yet we were not far away. Otherwise, good stay, we really were happy with your organization. Good location,quiet and calm, not particularly comfortable toilets, to improve the bed, generally sufficient. Simple and quick, to improve payment method. Quiet apartment very well located, clean and functional, a little dark but we gain in freshness. Equipment satisfying n the kitchen. Welcome very nice and especially the visit to the Nicolao workshop. Much enjoyed the two sets of keys. Ideal for one or two people. To recommend. The apartment N 48 we rented was great, great location, comfortably arranged. Well located, well equipped, nice and quiet, warm welcome, we keep the address for a future visit; we recommend it. 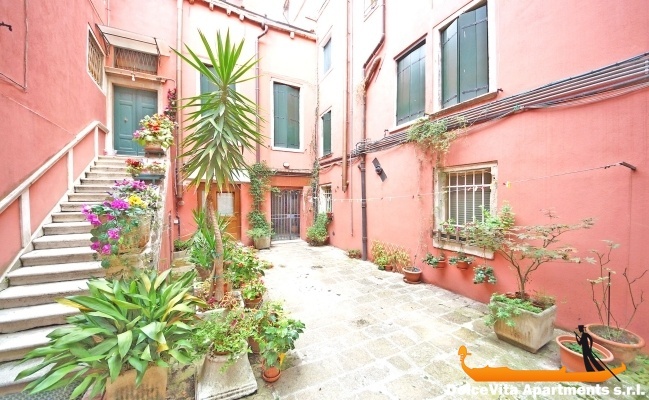 Charming small apartment very well located, close to everything: do their shopping at the Rialto market is the top! Excellent bakery just down the street!. In a small very quiet street, on the first floor in a lovely little courtyard full of rose plants. Address noted for another trip to Venice !!!!!!! Apartment very well located, 2 steps from Rialto and yet very quiet, it looks smaller in reality than on pictures. Excellent bedding which is necessary to recover in these days of movement. Good availability for the welcome and precise instructions. Regarding the renting, well-established and efficient system, no surprise. To recommend. I put the note 5 to this apartment, which is very clean and well done. The service is quite ok, no surprises on arrival. We will recommend your service. The location of the apartment is excellent, in a few minutes you walk to Rialto or to Cà d'Oro water bus and it is very quiet. Not a positive test there are the beds little uncomfortable! Since there is only one room more than the kitchen, I would recommend a nice sofa-bed, where by day you can sit if you do not want to go around. Even some new pots and cutlery in the kitchen would not be bad :) Otherwise we enjoyed very much . The welcome was great and very nice. The apartment is spotless and the second week we received clean towels without having requested. For many years I am always regularly in Venice at the beginning of December and next year I will try to book again from you. Nothing is perfect and we will give 4, the apartment is very nice, bright, quiet, well distributed. functional and above all well-heated. The welcome was also very friendly with a plan prepared quite useful. Your service was simple and effective, we thank you. It is a small but comfortable apartment, where nothing is missing. Very clean and tidy. Extremely quiet at night. The owners are very kind and very helpful providing a lot of information on how to move around the city, to eat and a detailed map with the supermarkets in the area. A little further there is a bar - restaurant where you can have breakfast. The Rio Terrà it is not busy, then as soon as you take it you are immediately out of the crowd. Located in a good place. Very close to the Rialto Bridge and Piazza San Marco, as well as the Bridge delle Guglie and the Strada Nova. Convenient vaporetto 1 taken at the Ca 'd'Oro. We had a nice time visiting this fabulous city of Venice. For the apartment all positive; ideally placed close to the Rialto we spent three remarkable nights in the total quiet after being warmly welcomed in the place of the appointment. The apartment is very clean, everything is neat, equipment that corresponds well to description. really positive. To recommend! Very competent reservation service; we received all necessary information and we had no surprises apart some bills 'salty' at the restaurant but that does not concern you. Following your questionnaire, my answer does not require very long reflection to assign 5 points to apartment No. 48. Indeed, ideally located at the limit of Cannaregio and close to the large channel and vaporetto stations, its location allows to move quickly in all directions. It is perfect for a couple or a single person. It is located in a quiet calle. 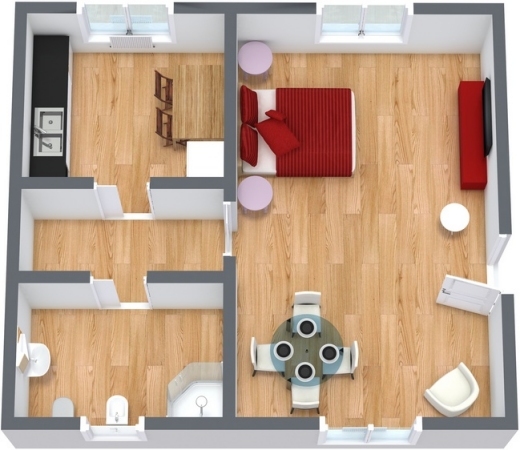 Very well equipped, everything is functional, and perfectly suited to a small apartment. Finally, while being personally of Venetian origin I can be accused of chauvinism, I can not resist the temptation to congratulate the owner for his good humor and the quality of its welcome well above what one would expect of lessor in such circumstances. As for your service, it was quite live up to my expectations. The apartment N. 48 is definitely a surprised gem! It locates in a quiet area but approximately 200 feet away, there is the popular street, Strada Nuova, crowded with visitors walking from Piazza Roma to Piazza San Marco. The apartment looks almost new and clean with beautiful wood floor in the living area and in the kitchen plus colorful tiles in the bathroom. The furniture and the appliances are well maintained and functional. Unlike hotel, this apartment offers a sense of warmth with a big vestibule as we open the outer door. It also offers privacy as we have our own apartment. The extra bonus for this apartment is the owners, Susanna and Stefano, a famous costume designer who also own the Nicolao Atelier located in the Jewish Ghetto. We were fortunate to have a tour inside the atelier, browsing through all those beautiful costumes dreaming of returning for the next Carnival of Venice. Small functional apartment, very clean and quiet. Very good location! Recommended! The apartment is comfortable for two people, well-equipped and finished. It is also convenient for the location, good for walking (very close to St. Mark's) and for the vaporetto (two steps from Fondamenta Nuove), and the proximity of supermarkets. I forgot to tell you that I really liked that we each have our key of the apartment so 5 out of 5 for the note, because 40 years after our first visit to Venice this element of independence is important for the duration of marriage. The apartment is ideally located and it is very quiet. It was very clean and Susanna the Italian we met was fantastic with us. Your service is highly recommended. Thank you. rating 4,5, great location, little snag on arrival, delivery of the keys took place at 16.00, but before the kindness of the owner, hard to be angry. I recommend it for position, beauty, finishes ... so if come back to Venice I will certainly choose it ! pretty and clean apartment, great location in a quiet area. Very good welcome from the owner. The only complaint one can make is that there are a few dishes (including bowls and maybe 1 or 2 extra pots are very useful). Apartment clean and well located close to vaporetto stop and restaurants and next to a bakery and a greengrocer. We enjoyed the quiet because it gives on an interior courtyard and the welcome and the kindness of the person who gave us the keys. I'll give it points 5, justified by the housing quality,tranquility, exceptional surroundings. Little paradise of calm, among the bustle of the streets of Venice - to note also that it is not easy to find, it must love to get lost in the maze of streets to deserve it. I stayed in this apartment for a month and was very comfortable -it was ideal for one person. Modern bathroom and great little kitchen to whip up my gnocchi and pesto and I loved making my Italian expresso in the pot provided (I bought myself one to bring back home). Cozy apartment and certainly particularly good situation. Small enough, clean and well stocked with pots and pans. The owner of the apartment was very nice and helpful. We remained well impressed. Excellent position and equipped enough, some problems with the parable and neighbours a bit noisy in the morning, but I recommend it. Nice apartment, well located in Venice. Owner kindly informed us very well on shops and restaurants nearby (note the refrigerator does little ice). Very well located, quiet, lacking only a little light, being narrow streets (first floor). Nice apartment, very clean, very comfortable and very well located; being inside the road and looking out onto an inner courtyard makes it very quiet and relaxing. Warm and friendly welcome of the owner - great willingness for the contact very easy and pleasant and for the useful information. Central apartment (a few steps from Rialto) and comfortable. Very close to a bakery and a mini market. The apartment is beautiful and in excellent position, it has satisfied our expectations. We were able to get into the apt early and leave off our luggage, which was great considering how tired we were from Jet Lag. The Apt was clean, comfortable and had everything we needed. The location of the apartment is wonderful ! It does not have a canal view but is very quiet and restful and has nice view of courtyard. The area of Venice where the apt is located had more of a neighborhood feel and not in the middle of tourist central – although, everywhere, including Rialto were very easy to walk to. We would definitely not hesitate to stay in the Apt again! Excellent hospitality of the owner. Great location (little flaw the bed for one person is a bit tight). Rating: 4.5/5 The apartment is cozy, very well located, clean, quiet. I have not given it 5 full points because I felt the lack of music: there is no DVD player or USB port on the TV to listen to the music. It is a very suitable apartment for couples. It is beautifully decorated and the kitchen and bathroom are new. In the kitchen you will find everything you need: it is very well equipped. We give 4.8 stars to the apartment: it is very comfortable and met our expectations. We evaluate the apartment with 5 stars. The apartment seemed to us fantastic, equipped with everything needed, was very clean and comfortable. The only comment relates to the collection of garbage: You must apply a label on the bag of waste, but nobody told me where I could find the label.